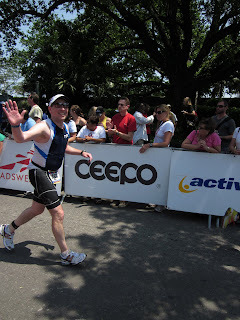 I covered pre-race separately here so I could come back to a shorter post in the future when studying my nutrition. Race morning I woke up often (as usual). The last time was 3:58 am and I just watched my watch tick to 4 am then got up. Ate a peanut butter sandwich while making coffee. Then ate a yogurt and got dressed, did my business and I was out the door at 10 til 5 am. Once outside I immediately noticed the strong winds. What's up with that? I also noticed how cold it was, low 50's with very little humidity. Luckily I had a jacket but I was missing my gloves. 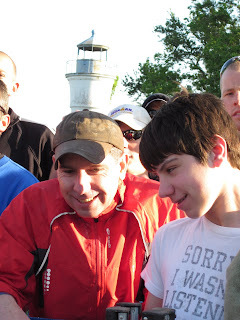 As Ryan drove to the race site, I started to get a knot in my throat thinking about the swim. I'm a BOP swimmer starting in the third from the last wave. I knew the swim was going to be rough for me and I hoped I wouldn't drink too much nasty Lake water. While nervous, I also looked forward to the sense of accomplishment I would feel when exiting the lake. We arrived at the transition area about 5:15 and started setting up shop. It was pretty dark, but I was prepared with a flashlight. As I set up transition, Ryan asked if I wanted to go look at the water, um no thanks. I'll check it out once I have the things under my control set, the water is not in my control. Before I was done setting up transition, Ryan came back and said I didn't want to go see it. It was as bad or worse than Saturday. Great. Not too long after that, the race director announced the swim was cancelled due to high winds (20-25 mph sustained) keeping the emergency vehicles off the lake. Wow. I felt relief and like I was being cheated at the same time. I mean c'mon, I came to do a 70.3 not a 69.1! At the same time, I have no experience swimming in that kind of water and I have no where to get it (except here). All the race day jitters left me and all the adrenaline left me, all at once. It became much less of a challenge very quickly. Once the swim was cancelled, the start turned in to a TT start. 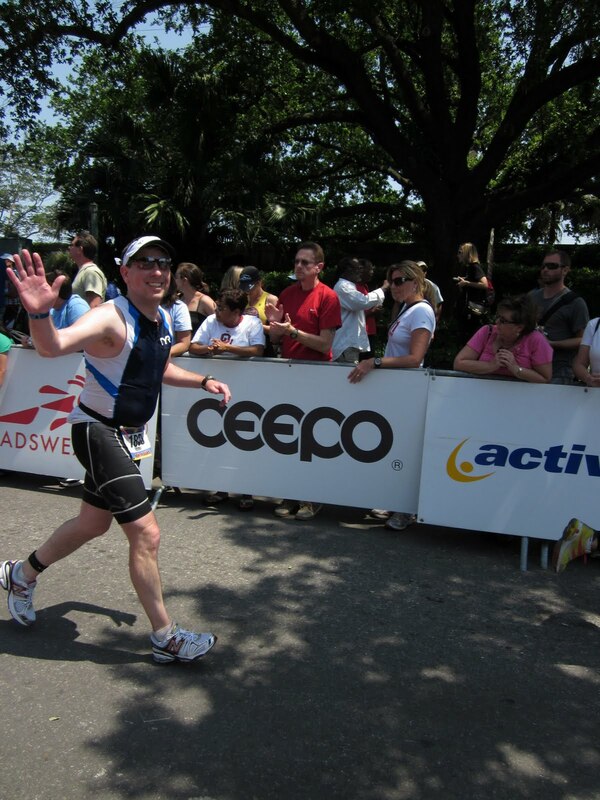 Pro's left every 30 seconds then age groupers left 2 at a time every 2 seconds. Like I mentioned above, I was no longer nervous at all. As we were all waiting out turn at a TT start, we all chatted. The guy next to me was doing his first HIM and he flew here from Peru to do it. Talk about jipped on the swim! The guy behind me was saying he couldn't believe he was already in this age group (M45-49). He's been doing tris for 20 years. I told him this was my second year and first HIM and he was extremely supportive. One thing I love about this sport is how friendly and supportive most people are. I've made friends with several people on line that I haven't met (yet) and many have been extremely supportive, motivating, inspirational, and provided good, straight forward advice. I'm not going to list everyone at risk of forgetting someone, but you know who you are. Trust me, I thought about you all during the run. It was also really cool to have my wife and son here to support me. My teenage son even got up early on Sunday (he was forced :-)) to come see me. Anyway, back to the race. Leading up to the race, I started to second guess my nutrition. Once again my online friends reassured me to stick with my plan. I put in the training, I'll be fine. For the bike I planned to drink a bottle of water an hour and take two S Caps per hour along with a Cliff bar the first hour, Gu Chomps the second, and a Gu the third. I mixed a bottle of Inifinite to bring along with my bottle of water just in case, and I brought a couple extra Gu's just in case. The Gu's were all taped to my bike with electrical tape. So we all inched our way up to the TT start and away we went, no adrenaline, no nerves, I was ready for a nice ride. Once I got started, I checked my hr monitor and it had stopped working. My plan was to keep my hr under 160 (upper z2) but without it, I had to go by RPE. Not a big deal since I train with RPE sometimes and I pay attention to my hr and RPE correlation. So the start was a short out and back past the start line. After the first 10 minutes, the next hour was in to a stiff 20-25 mph wind. I was pushing hard to stay above 17 mph but making sure to keep my cadence in the 85 to 95 range. I didn't have to look at my bike computer to know, just like RPE, I practiced enough I knew when my cadence was right. After a half hour I realized I hadn't eaten or had a drink yet and I really didn't feel like it due to the effort needed going in to the wind, but I remembered my dream and started eating and drinking water. I started with half a Cliff bar. It was harder to choke down at race pace than it is in practice. Guess I need to bike harder in training. Things were pretty uneventful (except for being stung by a bee) for the entire bike ride. It was crowded due to the TT start and there was no way to keep 4 bike lengths almost ever. I was really enjoying the bike ride. My legs felt great and all the training definitely paid off. This was my first time doing bottle exchanges and as I came in to the aid station, I slowed down, ditched my old bottle, found a clean line, pointed to a volunteer and said "you, water, thank you" and was on my way, no big deal. I finished a bottle of water and only half a cliff bar (plus 2 S-caps) the first hour, had planned on a whole Cliff bar, finished a bottle of water, a package of GU Chomps (plus 2 S-caps) the second hour, then a bottle of water and a GU gel the third hour (should have had 2 S-caps, more on that later). My legs felt great though my rear end was ready to get off the bike at about mile 40. So about the bee sting, shortly after the first aid station, we had a tail wind and I was clipping along at 23+ mph when I felt something hit my left shin/calf. I looked down and there is a bee on my leg, crap! I had a minor crash after a bug flew down my shirt and started biting me last year, so I knew I had to keep cool at 23+ mph. I looked behind me, no cyclists, came out of aero, reached down and brushed the bee away. Phew! Then about a minute later my calf started hurting. I looked down and saw the stinger, brushed that away, no big deal. My calf started burning for 2-3 minutes then no pain at all. After the race, there was just one small red mark where he stung me. Then 24 hours later, it started itching and 48 hours later I had a nice inch and quarter red welt/circle where I was bit. Bizarre delayed reaction. Race day adrenaline? Anyway, back to the bike. I stopped eating and drinking the last half hour and hammered the bike home with a nice 20-25 mph tail wind. Came in to transition feeling good, ran past some people laying down resting, others eating, changed shoes, helmet and arm warmers off, visor on, spin the vanity number belt around and off I went. I felt really good the first couple miles and was running sub 9 minute miles. My sub 2 hour stretch goal seemed to be within reach. I took some water and Perform at each aid station and ate a GU at mile 3. It was nice having aid stations every mile or so. It gave me something to look forward to. Somewhere between mile 3 and 4 I started to not feel so good. I'm not sure if I drank too much at the first couple aid stations or if it was because I didn't take any salt after hour 2 on the bike or both. My stomach started complaining and my lower back, glutes and hips started getting tight and achy. My next three miles slowed from sub 9 to 10's. Ok, I can still get a 2:05 or 2:10 half mary. Nope, the tightness kept getting worse and I'm pretty sure my stomach shut down. Mentally I felt great, cardio wise I felt great (I wasn't breathing hard at all), I just couldn 't get rid of the tight achy feeling, I'm guessing it was cramps? My time just went downhill from there and I really struggled the last 2 miles physically. It was frustrating mentally because I wanted to run faster and I knew I should have been running faster, I just couldn't run faster. I was really hurting at the end, though you couldn't tell from my pic running down the chute. Running through the finish line at Jackson Square in the French Quarter was awesome, then I stumbled around until I found my family. I sat down, drank some water and talked a bit then felt even worse. I left them to find a place to blow where I wouldn't gross too many people out. I sat in a grassy area for a bit until I felt better then went back to them, only to repeat the drill a couple more times. I never did blow, but I was as close as you can come to it. After a long workout I also have trouble regulating my temperature so I was too hot in the sun and too cold in the shade. I had a wool pull over that I wore half on/half off as I alternated between sun and shade. After about a half an hour, I started burping again which I took as a good sign, I also got my peripheral vision back. Just then I realized I didn't have it and I must have had tunnel vision. After another half hour I felt human again and watched my friend Ryan cross the line. I told Annie that if he was hurting as bad as I was, it would be a while before he was social. I went and found my family and had an Abita. After that we went and found Ryan and Annie and had a couple beers while recounting our war stories. 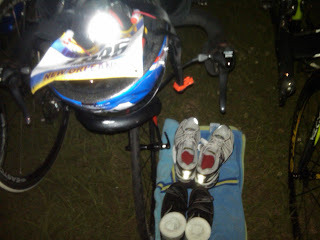 Then we went and picked up our bikes, took a shower, laid down for a while then went out to dinner. 5+ hours after the race I was finally ready to eat and eat I did. I was the first to start and last to finish. Half a sausage and pepperoni pizza, a piece of veggie pizza and a fish taco. The roof of my mouth was a little sore, dehydration? After that it was back to the hotel, compression socks, then laying in bed watching tv. It felt great. Overall it was a great experience and a well run race. The people of New Orleans were extremely friendly and the volunteers were amazing. I was well prepared except for the high waves. It's hard to say how the day would have gone after the swim, but I did feel good on the ride. I think I need to do more big bricks at race pace to dial my nutrition in. It's obvious to me now that a 30 minute run off the bike isn't enough. It does help for that first mile jello feeling but not the cramping. I need an hour run after a 40+ mile ride at race pace for that. Congrats! That's a great bike split and speedy transition! Sorry to hear of the GI and cramping issues. Could you have been dehydrated? And yay for your son! Glad he was there to cheer you in. Congrats! Looks like a good race overall. Shame you didn't get to do the swim for the full HIM experience. Guess that's what the next HIM is for! It could be tough to make sense of your raceday nutrition as wind speeds like that can really mess with your RPE. It could be the GU. My stomach doesn't do well with any gels at all. Solid foods, InfinitNutrition, and water. Water is to keep from cramping actually. So sounds like you need to work on your nutrition a bit because you have the distances down great! Congrats! Sorry / happy about the swim. OK, I read this a long time ago but didn't comment because I was on my phone and it takes too long to type a long comment (me? Long comment? Haha...I know). Way to go! It's so cool that your wife and son were there for you...even if he was forced, at least he had a smile on his face. It stinks that your run and the aftermath were so tough. 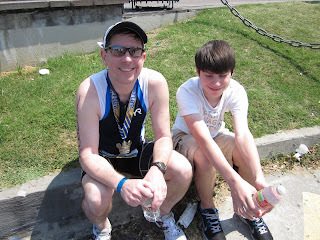 I know I was in misery the rest of the day after my first half. Wasn't this your first HIM? No matter the training, I think the first time you push your body those distances at race pace is going to be hard on your system. The glow doesn't really set in for several hours for me. At the finish line, I always say - NEVER AGAIN! BUT>>>then the afterglow hits and I find myself thinking "that wasn't so bad - I think I'll do another!"